All expedited orders (overnight, 2nd day, 3rd day) ship the same day if received before 12:00PM EST on a business day. Orders received after 12:00PM EST on Friday and weekend orders ship on Monday. We do not ship on Holidays. Below are the shipping guidelines from FEDEX/UPS and USPS. FEDEX/UPS OVERNIGHT is delivered the next business day, if your order is placed before 12:00PM EST. Friday OVERNIGHT orders are delivered on Monday and do not include holidays. FEDEX/UPS 2nd DAY and 3rd DAY are guaranteed, but they do not include Sat, Sun or Holiday deliveries. Start counting days the day AFTER you receive your tracking number. Thus, a 2nd DAY order placed before 12:00PM EST on a Monday is delivered on Wed, but orders received after 12:00PM EST would be delivered on Thurs. 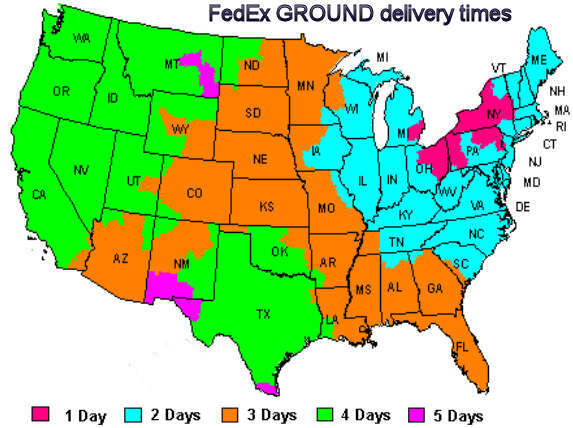 FEDEX/UPS GROUND delivery times are based on your proximity to Buffalo, NY. Please see FEDEX/UPS shipping map below. USPS Priority Mail is trackable and includes Saturday delivery. In our experience, delivery times can vary, however. As a guideline allow 2-4 days including Saturdays, however it sometimes takes longer. Deliveries are faster if you are close to Buffalo, NY.